Of the long lost golden hours. And “Summer” wreaths of flowers. And the winter now, means death. Of the dear, dead forms beneath. And dream we are young as then. Will prove our dream untrue. And yet too sweet to die. And talk of the days gone by. And forget we are growing old. But the Past’s are blue, and gold. And is sinking down the West. Full half have gone to rest. Are scattered far, and wide. Ere any roamed, or died. Blue eyes and tresses of gold. Belong to those days of old. And float on the Past’s smooth sea. And you must not look at me. 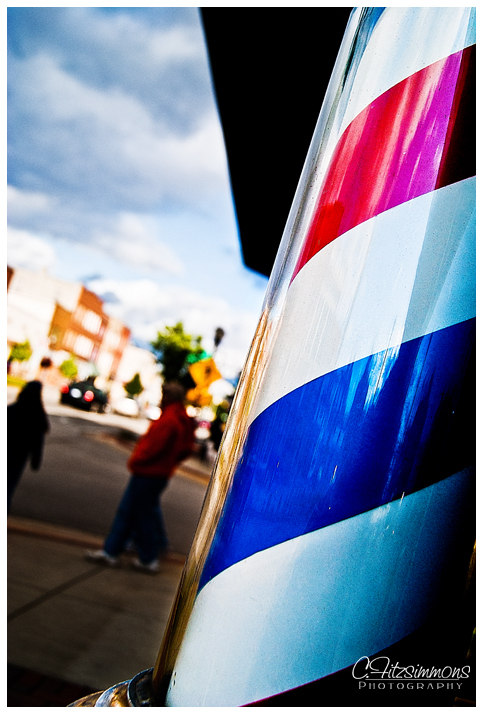 This entry was posted in 365 Day Photography Challenge and tagged 365 Photo Challenge, barber shop, blue, nostalgia, red, stripes, Sturgis, time, white by Cyndi the BookChick. Bookmark the permalink. Is that a barbershop pole? Old times indeed! I love the perspective, too.